My entire family loves honey. We use honey in our hot tea, coffee, swirled into yogurt and in various recipes that we make. Honey is a great all-natural sweetener and can be used in all kinds of different recipes from baked goods to desserts. Recently my family was introduced to a line of infused honey called Bee in Your Bonnet by Everyday Eclectic. Here's some additional information about the product and the company. "When crafting our handmade bottles of golden goodness, we at Everyday Eclectic maintain the same philosophy as with all of our other handcrafted goods: Keep it as pure and simple as possible. We like to let nature speak for itself, and use the beautiful, mouth-watering flavors it has to create a delicate balance of sweet and savory that is sure to delight even the most discerning palate." 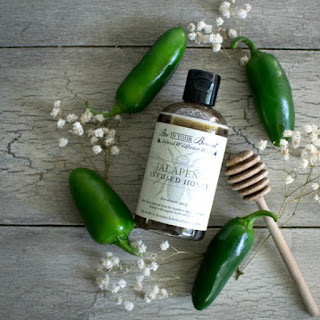 "Bee in Your Bonnet Infused Wildflower Honey is comprised of nothing less than the highest-quality pure raw wildflower honey - sourced from independent beekeepers in our own Southern Appalachian region, and infused with the rich, lovely flavors of a select variety of 100% organic herbs and spices." I've been using the Vanilla Bean Infused Honey in my fruit smoothies and yogurt. This product is made with 100% pure raw honey and certified organic vanilla bean. It's sweet but not overly sweet and I love the little bit of vanilla flavor you get with this particular honey. I'm not too fond of anything citrus so my mother (a pure citrus addict) has been using the Lemon Drop Infused Honey in her morning cup of hot tea or coffee. Since she's started using this product has been able to totally eliminate adding sugar into her hot beverages because she gets plenty of natural sweetness by using the honey. The Cinnamon Infused Honey is one that I've been using when I've been baking. I've added a teaspoon or two to my muffin and cookie batters have obtained fabulous results. When I add it, I subtract granulated sugar amounts so that I don't make my baked goods overly sweet. I love replacing sugar whenever I can. When it comes to using honey...try to think beyond the coffee and teacup! Honey is a great natural product that can help to flavor and sweeten just about anything! You can learn more about Bee in Your Bonnet Organic Infused Honey by visiting Everyday Eclectic online. They have other products too! Disclosure: Shelly received complimentary products for this foodie blog feature. No monetary compensation was received. Regardless of receiving complimentary products, Shelly is expressing her 100% unbiased opinion about the products. Your opinion & thoughts may differ. I Love the idea of all of these infused honeys. I would certainly use the lemon drop one In my tpea and the other 2 flavors both in baking and smoothies.